LG unveiled its G3 smartphone today, a successor to the G2, with a larger display, new camera options and some interesting UI tweaks. It certainly looks like a worthy Samsung Note series rival on paper, so we went hands-on with the device to find out if it measured up in real life. On the face of it, not too much has changed between the LG G2 and today’s G3 reveal, but look a little closer and there are some notable differences to be found in the G3. Some of those come in the aesthetics of the device; although it keeps the same ‘floating arc’ tapered-edge design seen in the rest of the series, it’s obviously a little larger overall to accommodate the bigger display. Despite the bigger chassis and generous display, it’s not overbearingly heavy. Officially, it meaures 146.3mm x 74.6mm x 8.9mm and weighs 149 grams. Unofficially, we’d expect it fit just fine in your pocket or bag without weighing you down. It also keeps the same rear-mounted volume and power buttons too, which although smaller this time around, are no less of a divisive feature. You’ll either grow to love the convenience of rear buttons on such a large device, or you won’t and it’ll remain a little counter-intuitive. We’d expect more of the former than the latter though, from our own experience. LG also made the switch to using a “metallic skin” for the new generation device, so it now looks a lot less plasticky – a vital change if the G3 is to compete against the latest models from rivals, most notably Samsung’s Note series. 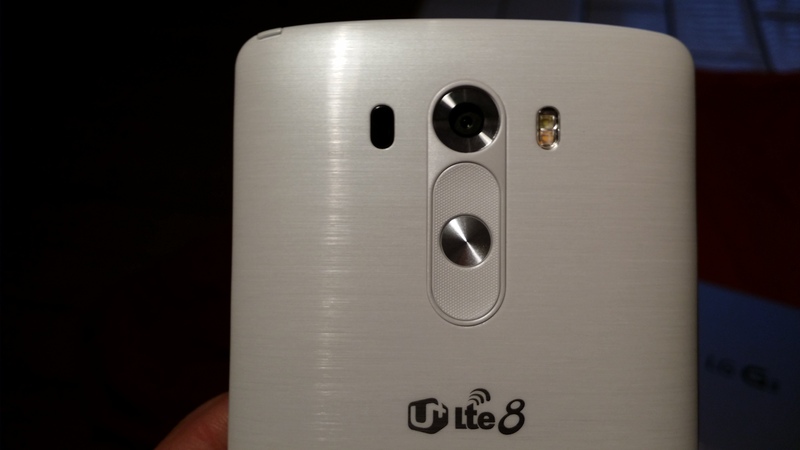 LG said the casing is scratch resistant too, so it shouldn’t end up looking tatty in a hurry. One of the biggest – in every sense – changes for the G3 is the inclusion of a 5.5-inch display, which has an iPhone 5s-beating 538 pixels-per-inch (PPI) and a resolution of 2560 x 1440 pixels. 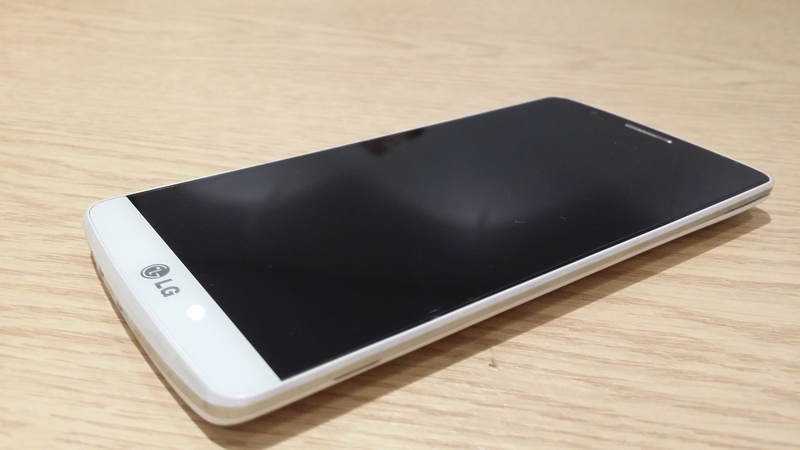 This makes it one of the only handsets on the market to offer such a high (Quad HD) resolution; notably, only the Oppo Find 7 has beaten it to the punch so far. First to market or not, the display is stunning and provides easily some of the best quality videos and images we’ve seen on a smartphone from our initial impressions. Bright, crisp and decent viewing angles; everything you’d want in a display. Nonetheless, there’s no point putting a huge display on a phone if no one can actually hold it. To that end, LG has gone to some lengths to ensure that the G3’s mammoth screen doesn’t make the device too unwieldy to hold. Thankfully, it seems to have worked and the 8.9mm-thick chassis sits easily in your hand – providing you don’t have particularly small hands; the tapered edges give the impression that the device is actually even thinner than it is too. One of the small changes under-the-bonnet is the switch to a quad-core 2.5GHz Snapdragon processor. Again, in initial tests it fared very well indeed, making scrolling from the top of a list to the bottom fluid and smooth. We’ll have to wait for the full review to find out what effect that upgraded screen and processor have on the 3,000mAh battery. The battery is changeable too, which is always appreciated and a benefit of using a non-unibody design found on something like the HTC One. It also allows the G3 to support wireless charging, which all-metal chassis do not currently. While the camera has been upgraded, it’s too early to say whether the changes have had a dramatic effect on the quality of the shots. 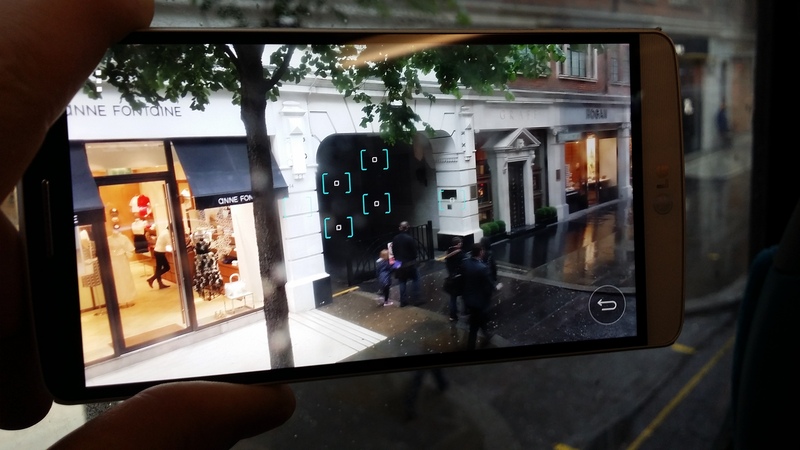 What is for sure is that the newly-added infrared laser-assisted auto-focus system (the sensor is just next to the 13-megapixel camera sensor on the rear) allows you to snap a shot with virtually no delay from opening the camera – a point of contention on the previous generation device. Similarly, LG has tweaked the camera UI to give a simpler, cleaner interface when taking a picture. All the options are still there though and can be displayed on-screen, should you wish. 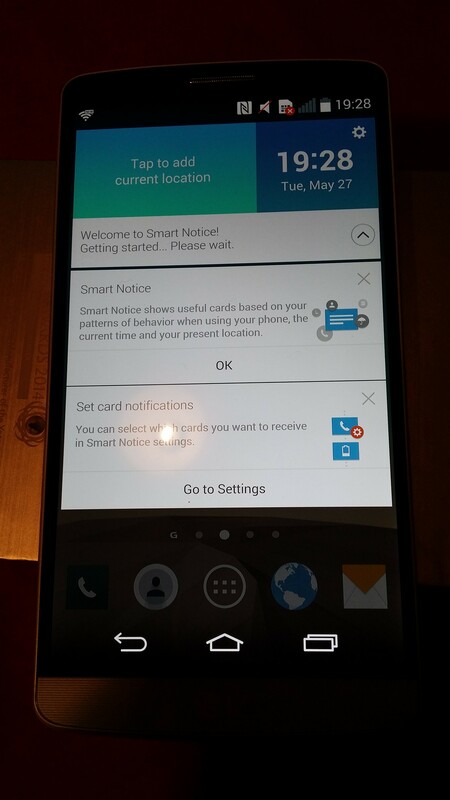 To make things a little more interesting than stock Android, LG has modified the KitKat version of Android (4.4.2) to provide a flatter looking interface and some custom software tweaks and services, like the Smart Notice system, which makes suggestions based on your phone activity, location and other factors. For example, it might suggest that you add a person’s name to your contacts if you speak regularly but the number isn’t stored, or it might ask if you want to return a call you missed while you were in a meeting as you don’t appear to have done that yet. We’ve barely scratched the surface here of the new LG G3, but from our brief time with the device, the speedy performance and impressive display already make a great first impression. We’ll be interested to see what kind of battery life we get out of it during a normal working week, although anything beyond the regular once-a-day charge requirement would be impressive. 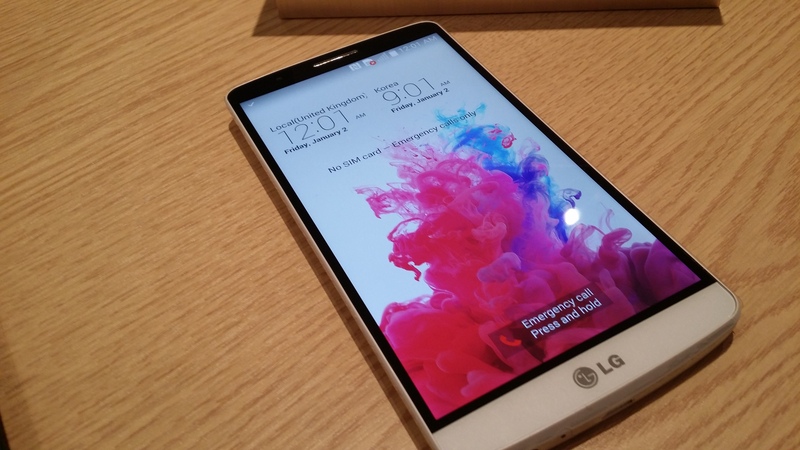 We’ll be back with our full review in the near future for a more detailed look at what the G3 has to offer.